In connection with plaintiff's motion to strike plaintiff's infringement contentions, the court denied without prejudice defendant's motion to require plaintiffs' to post a bond of $750,000 for defendant's anticipated 35 U.S.C. § 285 claim. "There is no general federal statute or civil rule governing whether plaintiffs may be required to post security for the costs and fees the opposing party may incur in order to proceed with an action. 'However, the federal district courts have inherent power to require plaintiffs to post security for costs.' . . . [E]ven if Defendants had demonstrated a reasonable likelihood of success on the merits . . . they have not shown that this case is 'frivolous,' that it arises from improper motivation, or that there is objective unreasonableness in the factual and legal components of the case. [Plaintiff] is seeking to protect patents he has owned for many years, and that he alleges were infringed after business talks broke down between himself and Defendants. While the Court may entertain a renewed motion if Plaintiffs again fail to satisfy Patent Local Rule 3-1, if the Court determines their claim is invalid under Federal Rule of Civil Procedure 11, or if the Court determines Plaintiffs lack standing, there is insufficient evidence for the Court to say this action is 'extraordinary' as currently litigated." The court denied defendant's motion for summary judgment that plaintiff's TCP/IP wireless transmission patent was invalid for lack of patentable subject matter because the claims contained an inventive concept. "[Defendant] alleges that the asserted claims of [a patent-in-suit] are invalid under 35 U.S.C. § 101 because they claim the abstract idea of allocating wireless bandwidth based on packet contents. . . . [Plaintiff's] expert opined that the claimed improvement 'schedules the flow of information on the network according to the claimed method as opposed to how it would otherwise proceed.' . . . [T]he present invention 'specif[ies] how interactions with the [network] are manipulated to yield a desired result' by reallocating bandwidth based on the contents of packet headers. Even though claim 1 itself does not provide a detailed explanation of how packet headers are used to allocate the bandwidth, the inventive concept lies in the limitation of using packet headers to allocate bandwidth, not in the details of implementation." The court denied defendant's motion for summary judgment that it did not contributorily infringe plaintiff's WiFi-based positioning patent and rejected its argument that the accused software had substantial noninfringing uses. "The parties’ dispute reduces to whether the 'component' is the entire Android open source and [Network Location Provider (NLP)] code (i.e., the Android operating system) or the 'location injection functionality or the location injection functionality in conjunction with NLP.' . . . Software may be a 'component' under section 271(c). Software programs may be made up of smaller software units though, each of which may also be a 'component' under the statute. . . . Here, the component of the patented system that [defendant] provides is the computer code that allows a device to collect a WiFi-based position estimate (and an uncertainty estimate) and pass that information to a satellite position module, i.e., the location injection functionality in conjunction with NLP. This functionality is 'separate and distinct' from other features in the Android operating system and must be 'treat[ed] . . . separately in analyzing contributory infringement.' Inclusion of [defendant's] code within a larger program, the Android operating system, does not change the component’s ability to infringe. Moreover, based on the expert reports that [plaintiff] has submitted and the expert testimony that it intends to offer, a reasonable juror could conclude that this component is suitable only for an infringing use." The court denied plaintiff's motion to exclude defendant's infringement expert as unqualified. "[Defendant's expert] is a physician with nearly twenty years of experience with medical claims groupers, which is the subject matter of the [patents-in-suit]. . . . [His] admitted lack of sophistication as a computer programmer in no way diminishes the fact that he clearly possesses specialized knowledge that will assist the jury. While the [patented] invention is 'computer implemented,' the invention lies in the methodology, not the computer programming, and it is not essential for a person of ordinary skill in the art to be a computer programmer." The court denied defendants' motion to reconsider an earlier order granting plaintiff's motion for a preliminary injunction based on the PTAB's subsequent grant of inter partes review. "Defendants acknowledged the precise prior art, which formed the basis of their inter partes review petitions, during the evidentiary hearing before this Court, but explicitly disclaimed reliance upon it for the purposes of opposing the preliminary injunction motion. . . . Yet we now learn that a whole host of arguments and expert declarations were submitted to the PTAB with Defendants’ six inter partes review petitions, presenting a potential 360 pages of briefing to the PTAB to suggest a cornucopia of possible references, combinations, and legal theories. Defendants, represented by eminently skilled and experienced patent counsel, made a strategic decision to assert only certain prior art evidence and no witness testimony, expert or lay, before this Court to oppose the motion for preliminary injunction. . . . [A] strategic decision to present different evidence in federal court than in an administrative court does not entitle a party to reconsideration simply because the administrative court later initiated review based on alleged facts and argument — including argument explicitly disclaimed before this Court." Success rates of motions to stay pending petitions for inter partes review (IPR) and covered business method review (CBM) have declined slightly over the past several years. In 2013, district courts ruled on 103 such motions and granted about 50%. In 2014 the number of motions increased to 245 but the success rate dropped to 41%. In 2015, district courts have ruled on 39 motions so far, with a success rate of just 38.5%. If the 2015 rates continue, we may see as many as 297 rulings with 153 motions granted. To view the complete report, click here. The court granted defendant's motion to stay pending its petition for CBM review, conditioned upon the PTAB's grant of defendant's petition, and found the potential simplification of issues would weigh in favor of a stay. "Until the PTAB issues its decision, the first factor under the AIA test weighs against the imposition of a stay. It is simply too difficult to predict that a stay would simplify the issues in this case, at least without relying on speculation. However, in the event that the PTAB grants [defendant's] petition, issues in this litigation would likely be simplified through a stay." The court denied plaintiff's motion to dismiss defendant's invalidity counterclaim for issue preclusion because of the Supreme Court's recent decision in Nautilus. "[Defendant] contends that an exception to issue preclusion applies because after the court determined that the claim term was not indefinite, the Supreme Court changed the legal standard for indefiniteness when it issued its decision in Nautilus, Inc. v. Biosig Instruments, Inc., 134 S. Ct. 2120 (2014). The Court agrees. . . . Because the Supreme Court’s decision in Nautilus changed the indefiniteness standard that the court applied in its orders in the prior case, there has been an 'intervening change in the governing law.' Further, indefiniteness is question of law. Thus, the doctrine of issue preclusion does not prevent [defendant] from litigating the definiteness of the [patent-in-suit's] claim terms." The Board granted the petitioner's motion for rehearing an earlier order denying its motion for joinder because the denial was "based on an erroneously narrow interpretation of 35 U.S.C. § 315(c)." "[A]lthough the plain language of the statute mentions joinder of a party,' and does not mention specifically the joinder of issues, the statute states that 'any person who properly files a petition under section 311' may be joined at the Director’s discretion. Filing a petition under § 311 is, therefore, a predicate to joinder. As noted by Petitioner, § 311(a) specifies who can file a petition for inter partes review. Under that section, 'a person who is not the owner of a patent may file with the Office a petition to institute an inter partes review of the patent.' Thus, when 'any person' is read in light of § 311(a), the only person excluded by the language is the owner of the patent at issue. More specifically, the statute does not exclude a person who is already a petitioner in an instituted review proceeding that is the subject of the joinder analysis. The choice of Congress to exclude only Patent Owners is telling. . . . If the legislature meant to exclude joining the same petitioner to an instituted inter partes review, it is unclear why it used the word 'any' in the statute, such that 'any person' who properly files a petition may be joined. Congress could have specified 'any non-party' instead of 'any person.' An interpretation that requires us to read 'any party' as excluding a same petitioner, in essence, reads the word 'any' out of the statute and ignores the statutory language of § 311(a)." The court granted defendants' motion for judgment on the pleadings that plaintiff's Internet based affiliate pooling patent was invalid for lack of patentable subject matter and found the patent lacked an inventive concept. "[T]he [patent-in-suit's] claims, viewed individually and as an ordered combination, only instruct the practitioner to implement the abstract idea with routine, conventional activity on a generic computer. . . . The assigning of unique identification codes, providing access to URLs, and generating URLs describe routine, conventional activity of how computers communicate with each other via the Internet. Although more elaborate, this is akin to issuing customers at a butcher shop unique numbers which are then called, or tallied, to service the customer uniquely and independently of other customers." The Board vacated earlier decisions instituting IPR because the petitioner failed to identify a real party in interest. "[W]e determine that [the] Petitions do not identify all RPIs. Thus the Petitions are incomplete pursuant to 312(a), which dictates that we cannot consider the Petitions. . . . Granting [the petitioner] a month within which to correct its incomplete Petitions is futile in this instance because, even if corrected, the earliest filing dates that could be accorded to the Petitions would not fall within the one-year period specified by the 35 USC 315(b) statutory-bar. Because we cannot consider the petitions, we terminate these trials. Furthermore, because the Petitions should not have been considered at institution, we vacate our Decisions on Institution." The court denied without prejudice defendants' motion for judgment on the pleadings that plaintiff's reimbursement system patents were invalid for lack of patentable subject matter because defendants' arguments were based on a unilaterally designated representative claim. "'[A] party challenging the validity of a claim, absent a pretrial agreement or stipulation, must submit evidence supporting a conclusion of invalidity of each claim the challenger seeks to destroy.'. . . In order to narrow the issues, and to conserve both the Court’s and the parties’ resources, the parties are encouraged to stipulate to representative claims. Absent a stipulation, Defendants will be required to address the challenged claims individually in any subsequent motion." Download our 2014 Year in Review Report! Is patent litigation activity declining? How do courts and judges compare? How has patent reform impacted litigation? What’s happening in the PTAB? The report is free for everybody and may be downloaded here. Is Forbes wrong about Judge Robinson and Judge Koh? Is it true? Is Judge Koh really “tough on defendants?” We searched Docket Navigator and found that Judge Koh has ruled on 36 contested motions for summary judgment (not 17) and she granted 10 (not 3) for an overall success rate of 28%. Limiting the query to summary judgment motions that defendants are likely to file (noninfringement, invalidity and unenforceability), shows that Judge Koh ruled on 24 motions and granted 7. That’s a 29% success rate. The truth is, when it comes to summary judgment, Judge Koh is no tougher on defendants than the national average. How does Judge Koh compare with other judges? Nationwide, judges have ruled on 3,519 such motions since 2008, of which 1,003 were granted, for a success rate of 29%, the same as Judge Koh. The truth is, when it comes to summary judgment, Judge Koh is no tougher on defendants than the national average. Fisher’s article also takes aim at Judge Sue Robinson. “Only 3 times has a claimant ever won on SJ in front of Judge Robinson . . . out of more than 1,000 cases heard.” According to Docket Navigator data, Judge Robinson has ruled on 59 motions for summary judgment of the type a claimant might file (infringement, no invalidity or no unenforceability) and she granted 15. That’s a 25% success rate. Nationally, all judges have ruled on 1,342 such motions, of which 359 were granted, for a success rate of 27%. The truth is, claimants are about as successful on summary judgment in Judge Robinson’s courtroom as the national average. Flawed data leads to flawed analytics which can lead to flawed decisions. Litigation analytics can be a powerful tool, and increasingly a necessary one. Last week, Law360 reported a warning from a panel of legal department heads to law firms “slow to adapt to the analytics-driven future: Get on board with Big Data, or get left behind.” But unreliable analytics can do more harm than no analytics. Flawed data leads to flawed analytics which can lead to flawed decisions. Who (or what algorithm) reviewed the data, and on what basis were codes and classifications assigned? Is the process transparent, or does it occur in a secret, proprietary black box? Is the underlying data available for independent analysis? If the analytics you are relying on could not withstand vigorous cross-examination on these questions, should it really form the basis for any decision that impacts your clients or your business? At Docket Navigator, we collect raw data from government sources. That data is then cleaned, coded, classified, and summarized by hand - in most cases by licensed U.S. attorneys. We rarely rely on automated processes and do so only where interpretation of the data is not required and the automated processes consistently yield highly accurate results. Even then, the data is reviewed for accuracy and normalized by hand. We never rely on natural language or text recognition algorithms to interpret data. While we do not claim to be free from human error, our software engineers have developed a series of checks and safety nets to identify gaps or inconsistencies in our data. Additionally, most Docket Navigator data is first published in the Docket Report and vetted by the 11,000+ patent professionals who subscribe to Docket Navigator. The underlying data is available to Docket Navigator subscribers for independent review and analysis via our publicly available database. 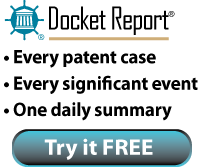 Docket Navigator recently released its 2014 Year in Review, a fresh look at how the patent litigation landscape changed in 2014. The report is free and available for download here. The court granted defendant's motion for summary judgment of no provisional remedies because plaintiff provided no actual notice of its patent application. "Pursuant to the plain language of § 154(d), the alleged infringer must have 'actual notice' of the 'published patent application.' . . . [N]one of [plaintiff's] evidence identifies the [patent] application by name. At best, it is evidence of constructive notice which, consistent with the statutory language, the case law, and the legislative history, does not constitute 'actual notice' for purposes of claiming provisional remedies. Moreover, the court rejects any inference that [defendant] had an affirmative duty to search for patent applications published by [plaintiff] because of the parties' litigation history. . . .To find that the patentee has no affirmative duty to provide actual notice to an alleged infringer, but that the alleged infringer has an affirmative duty to search for patent applications, would turn the legislation on its head." The court granted in part plaintiff's renewed motion for a finding that defendant was in contempt of a preliminary injunction and sanctioned defendant $860,600 plus attorneys' fees. "[Defendant's CEO] emailed a copy of the preliminary injunction order to [a third party] shortly after it issued. [The CEO] and [third party] are close friends and business associates. They agreed that [defendant] would transfer around 4,000 keyboards to [the third party] before the injunction took effect, and [the third party] would only pay [defendant] for the keyboards when [he] sold them to third parties. . . . [Defendant] argues that these sales did not violate the preliminary injunction because its 'consignment' sales to [the third party] occurred before the injunction took effect and [his] sales to third parties were outside of [defendant's] control. [Defendant] is wrong. . . . [Defendant] did not sell the enjoined keyboards to [the third party] until [the third party] paid [plaintiff] for the keyboards, which was after the preliminary injunction took effect. . . . Indeed, [plaintiff] reclaimed 1,800 keyboards which [the third party] had been unable to sell, confirming that ownership of those keyboards never transferred to [the third party]." The success rate of motions seeking a determination of invalidity for unpatentable subject matter has increased to 69% in 2015, up from 58% in 2014 and 25% in 2010. Thirteen such motions have been filed so far in 2015, while only eleven were filed in all of 2011 and only eight in all of 2010. If the current rate continues, we may see 140 such motions by year end. Click here to view a Motion Success report showing success rates since 2008 and links to the underlying court orders. The court granted plaintiff's motion for summary judgment that defendant's hypothesis testing patents was invalid for lack of patentable subject matter because there was no inventive concept. "[T]he patents describe . . . 'a method of automatically applying hypothesis testing to a data set' . . . The commercial embodiment of the patents is software compatible with a personal computer and it is marketed as a business process improvement tool for users with little or no previous exposure to applied statistics. . . . [T]he limitations of the asserted claims recite only well-known, conventional activities. . . . Although certain additional limitations, such as providing descriptions and explanations 'understandable by a user unfamiliar with statistical analysis,' add some semblance of particularity . . . 'the concept embodied by the majority of the limitations describes only the abstract idea of [hypothesis testing].' The addition of detailed steps alone will not transform an abstract idea into patent-eligible subject matter." The court sanctioned plaintiff for disclosing defendant's litigation budget and corporate revenues in an unrecorded PTAB hearing. "This case highlights what is likely to be a recurring issue as more cases are brought for inter partes review after a patent suit has been filed in district court. . . . [T]he PTAB presumes that all 'documents and things' used in an inter partes proceeding are to be made public, unless it grants a party’s motion to seal. At this time, there is a dearth of case law on the interaction between a district court’s protective order and proceedings before a PTAB panel. . . . Counsel should therefore have taken care to avail themselves of procedures to avoid inadvertent disclosure of protected confidential information such as a motion to seal under 37 C.F.R. § 42.14 or a request that the protective order be modified. . . . Complete good faith compliance with protective orders is essential to modern discovery practices and counsel must temper their zeal in representing their clients with their overreaching duty as officers of the court. . . . Plaintiff is ordered to join with Defendant in a motion to the PTAB, requesting that the information relating to litigation budget and revenues be sealed. Plaintiff is sanctioned in the amount of $2,500.00, which is payable to the Clerk of this Court . . . "
The court denied plaintiff's motion to strike defendants' preliminary invalidity contentions as to seven references that were not cited in defendant's petition for inter partes review. "Plaintiff contends that Defendants raised or reasonably could have raised these seven references at the IPR, and therefore Defendants are estopped from raising them in this litigation, pursuant to [35 U.S.C. § 315(e)(2)]. . . . At base, the dispute here centers on one of Defendants’ references: a LeakMaster A240 smoke machine . . . made by Plaintiff and sold on July 1, 1998 in Encinitas, California. Defendants contend they could not have put forward this reference in the IPR because [the reference] is an actual physical machine, not a patent or printed publication. Defendants contend that the [machine] is properly combined with the other six disputed references to create new grounds of invalidity, which could not have been presented in the IPR. Plaintiff argues that – even though the [machine] itself could not have been admitted – Defendants could have instead put forward the [machine's] owner’s manual, which Defendants had in their possession at the time of the IPR. However, the physical machine itself discloses features claimed in the [patent] that are not included in the instruction manual, and it is therefore a superior and separate reference." The court granted defendant's motion to exclude the opinions of plaintiff's damages expert for failing to disclose the basis for apportionment. "During direct examination, [the expert] explained that he analyzed [defendant's] Technical Requirements Document (TRD) for the IP Multimedia Subsystem (IMS), and . . . concluded that 16.7% of the functionality of the 38.8% of the IMS system -- 6.5% of the system as a whole-'relate to' the [patent-in-suit]. . . . [Defendant] argues that [the expert's] report does not disclose how he determined whether a requirement or component was 'implicated by' the [patent-in-suit]. . . . [The expert] concluded that 6.5 to 7% of [defendant's] IMS network related to the patented subject matter, but provided no basis for how he determined which features 'related to' the patent. This determination provides the entire basis for [his] opinion, and thus requires at least some explanation. Without such, [the expert's] report does not meet the requirements set forth in Rule 26."